Oh my, Maggie, my coffee swap partner, has totally blown me away with a wonderful package!!! I was so, so thrilled! Some sweet alpaca/merino sock wool dyed with natural fibers from The Natural Dye Studio. It is so incredibly soft and I love the colors! Delicious treats and Peace Coffee. I love Peace Coffee, and guess what? Maggie sent me the Twin Cities blend and I had never seen that one before. Plus homeade jam and muffin mix and chocolate. Where do I even start? Breakfast tomorrow? Chocolate and coffee tonight? Hmmmm…. And there’s more! Yummy stuff from Maggie’s own shop, Prairie Land Herbs. I wish you could smell this stuff. It’s amazing. 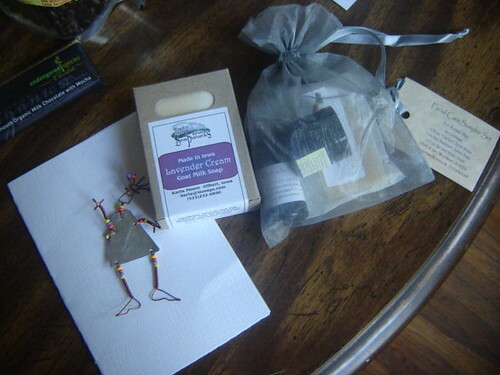 The facial care kit is from her company and the lavendar cream soap from Heart of Iowa Soapworks. Plus a super cute card! Maggie, thank you so, so very much!!!! What an absolutely lovely package. I adore everything and you really brightened my day! On another note, Guinifer finally got to me. I consider her to be the number one yarn enabler on the planet, and I couldn’t resist. 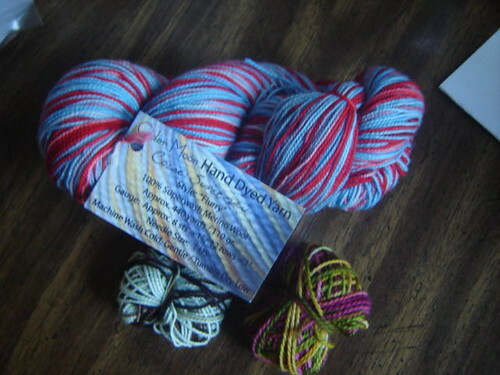 You see, I’ve been searching for an elusive red and blue colorway in a sock yarn. I kept seeing it in my head but never actually found any. Until she posted about Cider Moon. I clicked, and there it was: Superman Flurry (plus samples!). 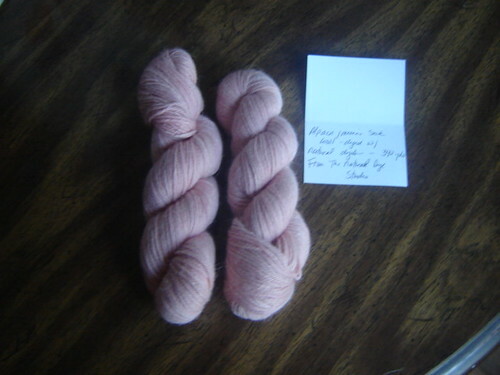 My last yarn purchase until….look up. Notice anything new on the blog? I saw that Superman colorway and was intrigued. Can’t wait to see how it knits up. That’s a fabulous swap package! Lovely goodies! I like the idea of the 10 project challenge, but I don’t know if I could keep up with it. I’m weak… so weak… Let me think on it, and I may join you! PS, did you get the fiberflix survey I emailed you? Let me know if it never got to your email, and I’ll send it again. Nice stuff! 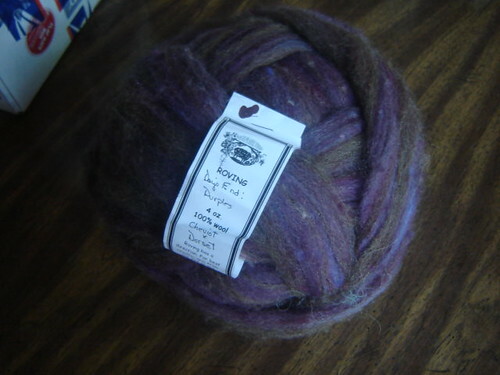 I especially like the roving (shocker) – it has great colors and looks like it’ll be nice to spin. Have fun! Does the challenge extend to spinning fiber too? Like if you spin up a batch of roving, does that count as an FO, or do you have to knit up the yarn, too? Or is the spinning stash a completely different animal, so to speak? I can totally see that Superman on a little boy too! Hmm, interesting challenge. Must think about it. 🙂 Great yarn!! And wow, your swap partner knows how to treat you right. Looks like a wonderful package to receive! I love your new blue and red yarn. What great goodies. I love the colors in the wool. Hahaha! You silly, that’s the blend you sent me last round! It’s very tasty. 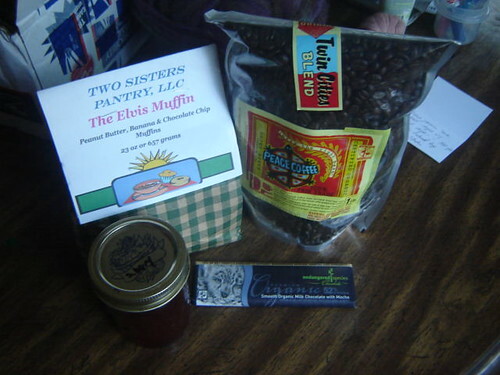 And in addition to the coffee envy & fiber lust…I am totally coveting the Elvis muffins! uh huh, uh huh! What a furry monster, super cute!